Easter Bunny Jr. has been in charge of the Easter Egg Factory for a year now, and has put quite a bit of work into renovating and modernizing it. However, his focus on customer service has also left parts of the factory un-maintained, and now he needs your help getting the factory up and running smoothly! 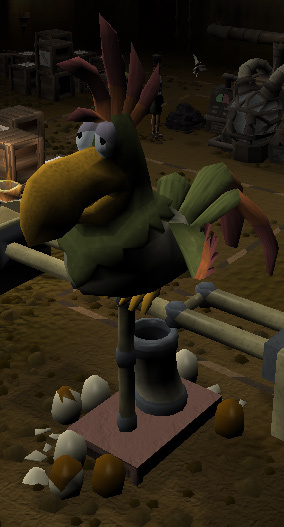 Help Easter Bunny Jr. get the factory back in tip-top shape so that Easter treats can be distributed throughout RuneScape! Note: This event was only available from 29 March 2010 until 12 April 2010. 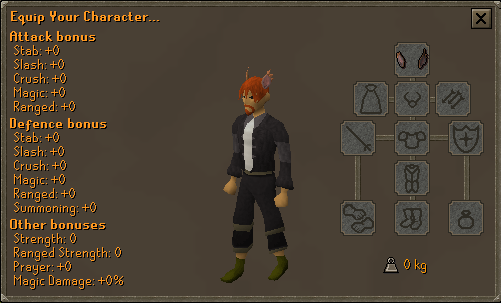 Talk to Charlie the Squirrel, southwest of Falador. 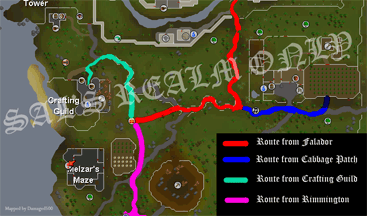 There are several ways of getting to the Easter 2010 Event. 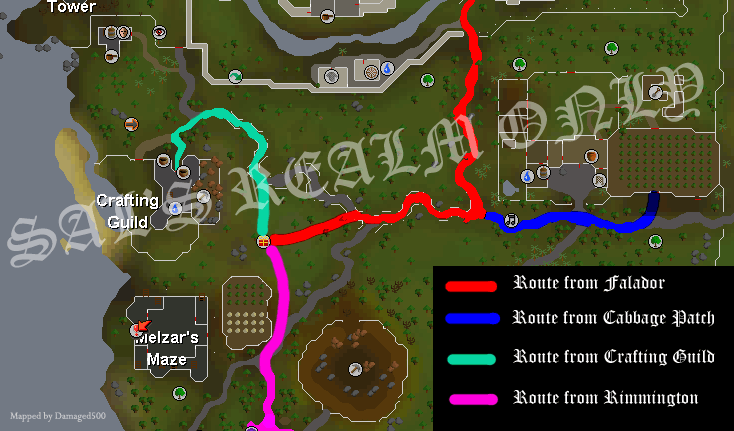 You can teleport to Falador and walk southwest, or teleport to the Crafting Guild with a Skills Necklace and go east, or teleport to your House (if it's in Rimmington), exit and go north or your last option is teleporting to the Cabbage Patch with your Explorer Ring(3). Talk to Charlie the squirrel southwest of Falador. Charlie will tell you to enter the rabbit hole which you can only do with nothing in your inventory until after you have completed the event. Fortunately he can move any items in your inventory into your bank. You will transform into a rabbit and enter the Easter Bunny's factory. Head north into the second room and talk to either the Easter Bunny or the Easta Buni. You learn the factory got modernized and there were some setbacks. Naturally you get to fix everything. Head back into the first room and speak to the Impling Manager by the oven. Remove the dirty components from the oven and go to the water tank just north of the oven and use each component with it to clean them. Use them with the oven to fix the oven and then talk to the Easter Bunny again. Your next task is to fix the Egg-painting Machine so go to that machine and talk to the Impling. You need to find the Glaze Crate which is in a random box somewhere in the factory. Search the boxes until you find it and return to the Impling. Now it's art time! You'll get three vials of red, yellow, and blue glaze, a glaze colour wheel, and a bowl. How the color wheel works is if you combine two colors together in your bowl you'll get the color that is exactly in between them on the color wheel. For example mixing red and blue will make purple. 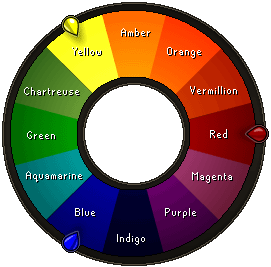 If you need one of the colors next to purple, add the primary color that is closest to that color. For example if you needed Indigo add more blue, and if you needed magenta add more red. Mix the three colors the Imp tells you to (they're random for everyone) and then it's back to the Easter Bunny for your next task. Go talk to Big Ben at the Conveyor Belt. You'll need to train the squirrels on sorting. Press the red button when anything that isn't a nut or a chocolate egg gets into the shaded area. This includes broken nuts. Next the Easter Bunny asks you to cheer up the depressed Easter Bird. Click through the dialog and choose the positive option for the three options when you get to each part. The Easter Bird is now cheerful enough to continue working for the Easter Bunny. Your final task is to run the factory in an Activity style finale. You will have 15 turns to complete your order and if you finish in no more than 15 you will get a bonus reward. Use your Management Planning window to control your workers. You can hire more workers, assign them to collect resources, or make products. For each worker assigned to a task you'll receive one product. For example, 2 workers gathering nuts will get you 2 nuts per turn;, 3 workers making Fruit Cake will get you 3 fruit cakes, etc. 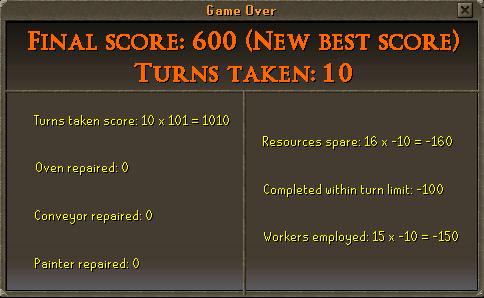 For every 5 workers you hire, you'll need to give them upkeep of 1 resource per turn. 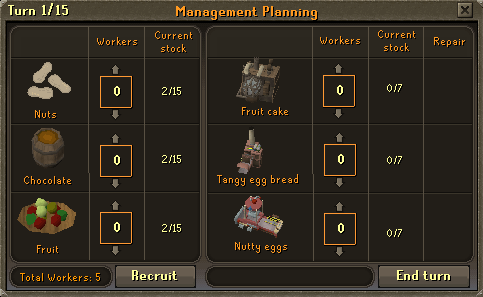 For more information, read the in-game guide once the Management Planning window opens. Start out by hiring 9 workers and collecting 3 resources of each kind each turn. If an machine needs fixing, make sure you check the box to fix it. It will take 2 resources per product so collect enough to make 7 of each as well as feed your workers (you'll need 21 resources of each total). Then assign workers to make your cake, bread, and eggs until you have 7 of each. With luck and skill you should have no problem getting through this. You gain the ability to summon a Squirrel every 30 minutes by using the Squirrel Ears. 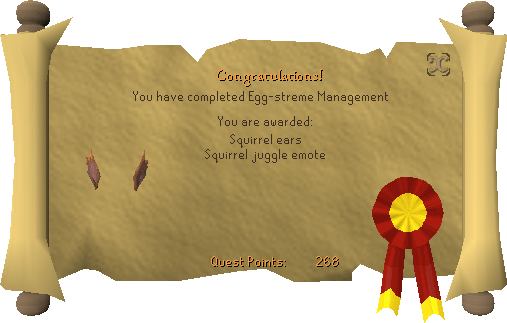 The squirrels last for about 2 minutes and you can only summon them outside the Easter Bunny's cave by right clicking on the Squirrel Ears. If you completed the order in less than 15 moves, you can summon both Charlie and Fluffy. If you complete the order in more than 15 moves you'll only be able to summon Fluffy.